A few odds and ends from the last week. I was running through nearby Wakaba today when a man on an old-timey bicycle rode by. One of those with the big front wheel and the tiny back wheel. Sadly, he was wearing a t-shirt and khaki pants, not sporting a ditto suit and bowler hat. 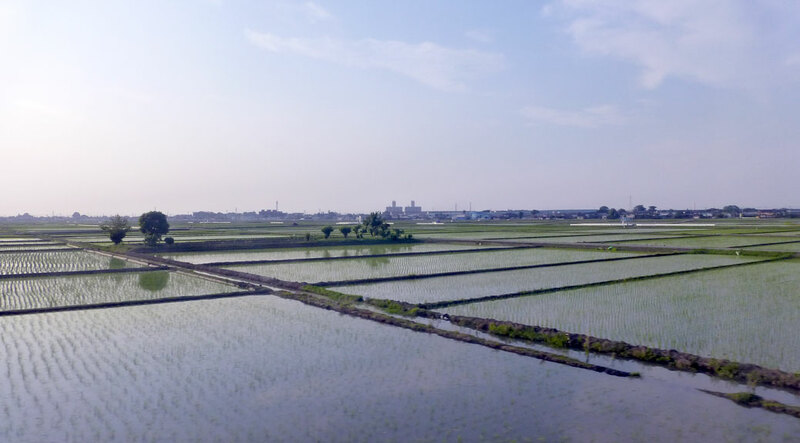 Rice fields flooded as the growing season gets underway. Paul McCartney could have modified the Beatles’ classic “Strawberry Fields Forever” if he’d been able to play his Tokyo shows last month. The rice fields are fully flooded all over Saitama as the growing season begins. It’s a throwback scene as farmers in straw hats tend to the fields from sun-up to sundown. Another neat scene on the main drag in our little part of Kawagoe last week. A bird set up its nest full of eggs in the awning over the middle of the sidewalk running in front of the shops. Instead of moving the nest or knocking it down, the shopkeeper taped some newspaper to the sidewalk under the nest to catch the droppings. The mama bird sat perched on the edge of the nest while person after person stopped to see what was up. We popped over to Ōmiya, one of the busiest cities in Saitama Prefecture, over the weekend. The plan was to visit the city’s famous bonsai nurseries and hit up the Keyaki Hiroba Spring Beer Festival. After a quick train ride, we walked the path to Hakawa Shrine. Statues and banners with squirrels are all over town. We quickly discovered the city’s love affair with the Ōmiya Ardija (Spanish for “squirrel”) soccer team, Ōmiya’s entry into the Japanese Professional Football League. The shrine was originally established in 473 B.C. It was impressive as usual, but the surrounding grounds were the highlight. 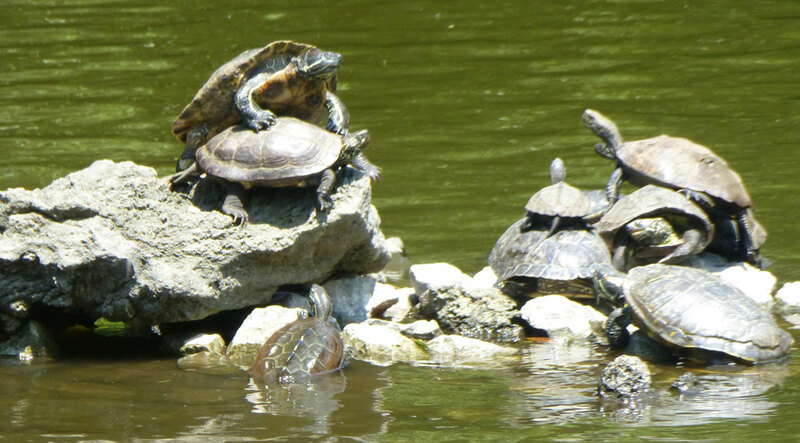 A pond is home to dozens of turtles, which swam and sunned alongside the pond, seemingly ignorant to the handful of gawking tourists. We had lunch from a stand in adjacent Ōmiya Koen, a large park with a soccer stadium (home to the Ardija), baseball stadium, velodrome and zoo. We ordered some veggie yakisoba and french fries and impressed the vendor enough that she complimented my Japanese! She was clearly lying, but it was a great confidence boost. We only found one bonsai nursery, which was cool, but fell into one of Japan’s numerous dichotomies. The nursery didn’t allow photographs and charged 200 yen for admission to the main nursery. Now, if I could take photos, I’d pay 200 yen. But, if I can’t get in for photos, I’m fine with glancing at the free stuff. The trees themselves are amazing. One looked like a 100-year-old maple tree, but only stood about 18 inches tall. The art and care that goes into creating the trees is something else. Along the way, we stumbled on the Cartoon Art Museum. The small museum featured the cartoon art of Kitazawa Rakuten. Impressive, but with displays only in Japanese, it lent itself to a quick tour. 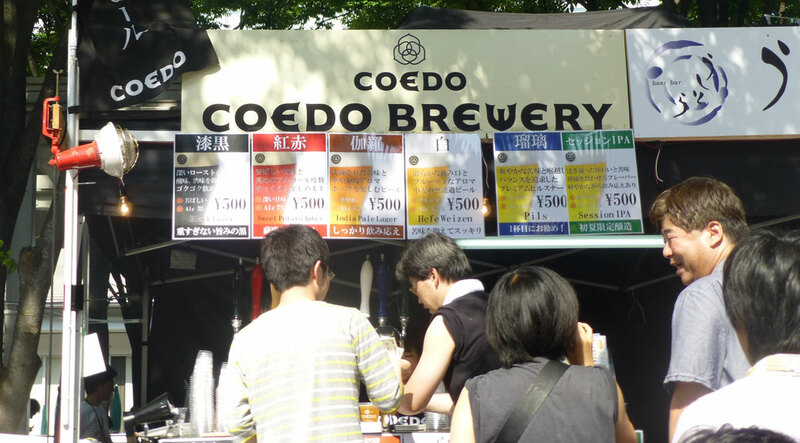 Coedo Brewery, Kawagoe’s premier craft brewer, set up shop for the weekend at the Keyaki Hiroba Spring Beer Festival in Ōmiya. Finally, we headed to the Saitama Super Arena for the Keyaki Hiroba Spring Beer Festival. Approximately 60 breweries from all over Japan, and a couple American breweries (including Oregon’s Rogue Ales) tapped their kegs for the weekend festival. It reminded me of the Oregon Brewers Festival on Portland’s waterfront, but in about a tenth of the space and with as many tents and people. Beer enthusiasts lined up shoulder to shoulder to partake in the best of Japan’s burgeoning craft brewing industry. We tried Hokkaido Brewing’s Melon Wheat and Raspberry White ales as well as Market Brewing’s Mango Orange Ale and Hop Seduction Session IPA. All were great, especially on a day where temperatures entered the 90s for the first time this year. Most of the breweries get their exposure at these types of festivals or in local supermarkets. The beer aisle at most grocery stores is still dominated by the “Big 3″—Kirin, Asahi and Sapporo. It’s great to see artisan brewing get some well-deserved attention. Drat it all. I was so looking forward to photos of the bonsai. I was even going to beg for more. Darn.